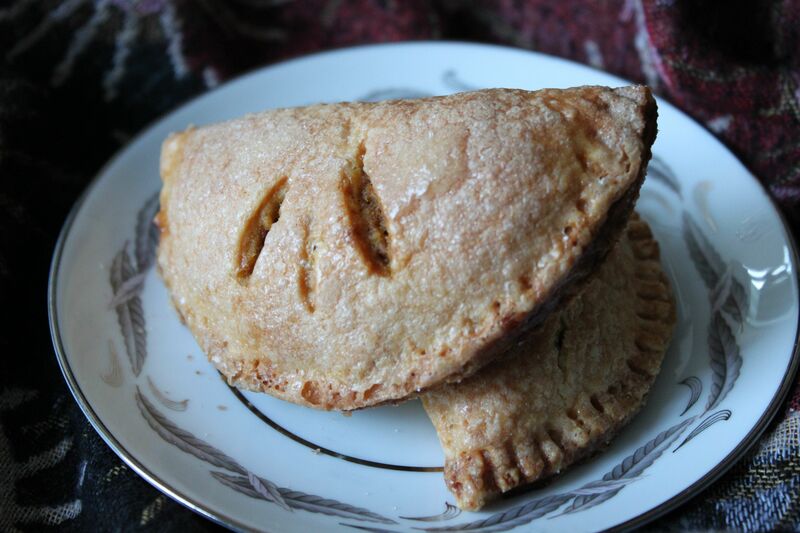 Pumpkin spice hand pies inspired by the Harry Potter series by J. K. Rowling. It’s almost Halloween; goblins, ghouls, and ghosts are abroad in the muggle world. If you’re like me then you’ve done your apple picking, your pumpkin hunting, and your woodland hiking. But at the end of a long day of jumping in leaf piles, you need something a little sweet to go with that cup of hot apple cider. I wanted to get this recipe out before that particular flavor of witchy October magic passes, while there’s still time to curl up with a pumpkin beer before we start mulling cider and delving into winter holiday territory. So here it is! This one goes out to anyone who spent their preteens waiting for their Hogwarts letter. Harry Potter is a series of seven books about an orphan boy who goes to wizard school. A half-giant removes him from his abusive aunt and uncle’s home at the age of eleven and takes him to a castle somewhere in the Scotland highlands where there is a giant three-headed dog in one of the hallways, a monstrous snake in the basement, and dragons are par for the course on field day. After that it’s a pretty standard good vs. evil, messianic metaphor. Harry is “the boy who lived,” chosen/marked (in the form of a lighting-shaped scar) by the evil Lord Voldemort. After killing Harry’s parents and leaving baby Harry with his famous scar, an half-dead Voldemort disappeared into whispers and legend. Harry and his friends, Ron and Hermione, must fight the forces of darkness and keep the wizarding world from falling into the persistent clutches of the dark lord. Pithy cynicism aside, I will say this: Harry Potter is damn magical. Harry, Ron, and Hermione were friends to me through a lot of tough times, times when I didn’t have a lot of other friends. I changed schools between elementary and middle school and spent most of fifth grade with any one of the thick books tucked under my arm like a security blanket. While I’m not sure it’s wholly responsible for dragging the millennial generation away from the television and teaching them how to use their imaginations, it’s definitely a fantastic read. Plenty of original characters and content keep Harry Potter new and novel in a trope-heavy genre, but a lot of the creatures, names, and thematic devices have their roots in classical myths and legends. Far from feeling recycled or old, these traditional elements of the book are as a stellar primer for fantasy as a whole. J. K. Rowling added her own flair and twist in such a way that it not only allows readers to get lost in the story, but to immerse themselves in the wizarding world. More than that, there are bright, shiny details that can be recreated in our own muggle one! Candy, Quidditch, fashion, wizard rock, things that have allowed the book to permeate our popular culture and subsist as a lifestyle beyond the release dates of the books and movies. This one is pretty straightforward: I wanted to take the time to craft my own, unique pumpkin pie filling, beyond that it’s a simple act of recreation. Normally I shy away from copying something straight out of the book, but so much of Harry Potter as a cultural icon has been about capturing the magic in some small way (I can’t be the only kid who tea-stained copy paper and printed herself a Hogwarts letter in green ink) it feels right to recreate and recapture some of that magic. Baking pumpkin pasties is, itself, a bit of a magic trick, taking the fictional and making it real! So, yeah, I never graduated from Hogwarts, but I maintain that witchiness is just conviction dressed up in billowy scarves. Preheat the over to 375 degrees Fahrenheit. One of these days I’ll get around to doing a crust tutorial, until then you’re just going to have to take my somewhat vague directions concerning the pastry part of pie. Combine flour, butter, water, and vinegar in a mixing bowl with either a pastry cutter or a clean hand. You don’t want to knead the dough so much as bring it together in a rough and shaggy ball. There should still be streaks of unincorporated butter visible when you’re done, but it should also be coherent. Set aside and refrigerate. The filling for this pie is super easy. Put all the ingredients in a bowl. Whisk thoroughly. Done. The tough part of this recipe is the assembly. Break the pie crust dough into thirds, flour your workspace and rolling pin, and roll out the first third. Find yourself a nice cereal bowl, ideally about 6-inches in diameter, and a sharp knife. Place the bowl rim-side-down on the dough, and then cut around the edge. Collect any excess dough, incorporate it into the second third (because the dough you just rolled out will be warm and squishy and the cool dough will help it roll out better), and roll again. Repeat until you have more dough circles than excess, scraggly bits. With a spoon, ladle a healthy portion of pumpkin into ONE HALF of the circle. I put about two tablespoons in each one, leaving approximately half an inch between the pumpkin goo and the edge of the pastry circle. Now, fold the clean half of the dough circle over the pumpkin; like you’re tucking a little orphan Harry into his bed in the cupboard under the stairs. Align the edges and press a fork in to the approximately half inch overlay, crimping them together. It takes a little practice – sometimes the crimped edge is too thick, sometimes there’s not enough space and pumpkin comes gushing out of little escape holes – but you’ll get a sense of it pretty quickly. Place the pasties on a cookie sheet lined with parchment paper. Using your sharp knife, delicately cut two or three slits in the top of the pasty. Using a pastry brush, coat each pasty in beaten egg, and then liberally sprinkle sugar over the surface of each. Bake for about 40 minutes*, or until golden brown. 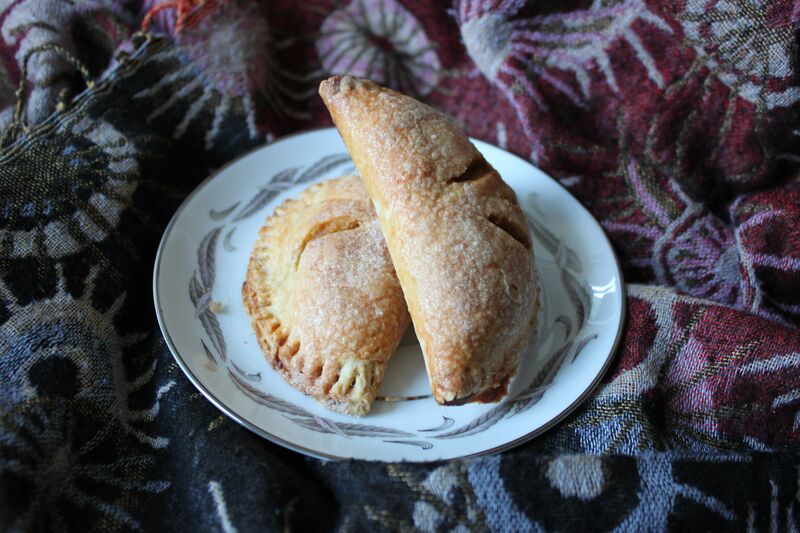 This recipe makes about 12-14 pasties, a great treat to have with your morning tea, evening butterbeer, or after a chilly, autumnal broom ride. *With pie I generally like to watch it myself rather than time it, but this is a good place to start. This looks amazing! Bookmarking this for Christmas!